Hemsworth Water Park and Playworld01977 617617work Country ParkHemsworth Water Park is one for the whole family to enjoy. Little visitors will love building sandcastles on the beach and jumping, sliding and swinging in the outdoor adventure playground. Jump on a pedalo for a delightful boat ride around the main lake or let someone else drive and have a ride on the miniature railway. Looking for a more relaxing experience? Spend time watching local wildlife in their natural habitat around the smaller lake or try your hand at fishing, available all year round. After all the excitement take a break and enjoy a warm drink with a bite to eat at the Lakeside Café. The café boasts views of the lake with seating indoors and out. There’s even a soft play area for the little ones to burn off some energy. There's so much to do! What will you decide to experience first? 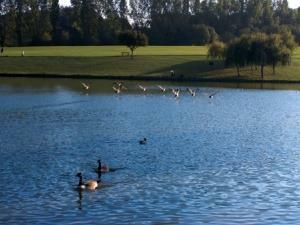 Hemsworth Water Park is one for the whole family to enjoy. Car parking is available on site for £3.00. Free parking for Disabled Blue Badge Permit Holders. For individual activity times please check Hemsworth Water Park's website. Just off B6273 in Kinsley.